Could the Wicked Stepmother have saved herself a lot of heartache and just given Cinderella lots of bruised apples? Perhaps rotten fruit hasn’t crossed your horizon yet, but it’s the one that stood out for me at university many moons ago. I think I have written about it once before, but it merits a reminder I think. It wasn’t the botulism, salmonela or listeria that most people know about that stood out for me. Parents can often be paranoidically fastidious about avoiding the well known food rot, but patulin seems to have fallen under the radar. Quite simply, its a chemical – a toxic chemical fungal matter that is produced from some moulds, for example penicillium and aspergillus. Does that mean anything to you? Well, to be honest, it didn’t to me either. It’s safe to say that although the apple is the fruit that I associate it with in my mind the most, it’s not the ONLY source of patulin. It shows as toxic effects in animals and it should be avoided in foodstuffs as far as is possible. As it is soluble in water, it is easily absorbed and can grow quickly. Although there isn’t much research on humans, there has been a lot of testing on how it affects animals. It shows significant damage to the stomach and lower intestines. Which Foods is Patulin Found On? Apples stick in my mind, but there is the possibility of it affecting apple juices, jams and pies. It has been found on cherries, vegetables and other fruits too. Cereals and cheese have shown to contain some patulin, but apples and apple products seems to be the biggest threat to our human diet. Most of the information on the toxicity of patulin is derived from animal studies and there is little or no experimental, or epidemiological, data on acute or chronic toxicity in humans if it is eaten in large quantities. There is the possible worry about the long term effects of eating patulin regularly and it seems sensible to take precautions and stay away from patulin where it is at all possible. Should We Stop Eating Apples? Patulin isn’t something that is going to stand up, wave its arms and induce vomiting and diaorrhea – well okay, it might if someone is intolerant or allergic to the apples or any toxins present, but in general, it might not do more than the odd slightly upset tummy. Should we ban apples because of its future potential? Of course not, that would be silly. Apples seem to be very good for us, and I wouldn’t stop my children eating apples just because of the possibility that a poison might affect their body a few decades down the line, but I do take care that the fruit I give them is bruise free. Can Patulin Be Cooked Out? Cooking or pasteurisation does NOT kill patulin. There could be some evidence, that in juices, with some preservatives, it could be mitigated. My lecturer simply told us to avoid all apples with bruises. You could minimise the risk by cutting out the bruised portions of apples where the bruises are small, or simply discard all bruised apples in the same way that it is recommended to discard all green potatoes. Discard any apples you cut open that have insect burrows and buy good quality apple juice. 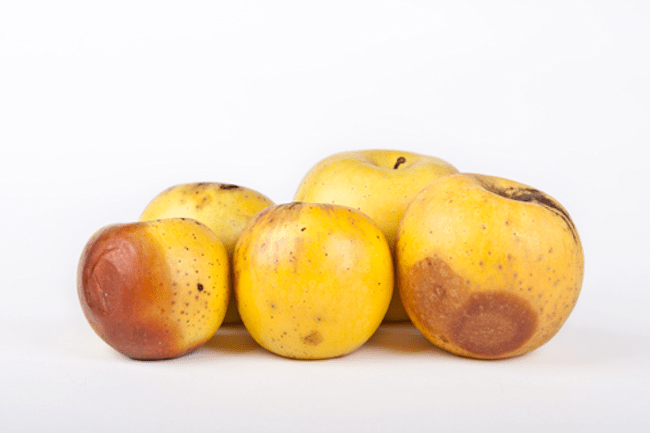 Physical damage can help promote the rot, so over handling of fruit can also be a problem. To keep your fruit in as good a condition as possible, I put mine in the fridge and cut off any bruised parts if I plan to make juice. I don’t overly worry about it, but I hate seeing little ones being given apples with brown bits on it. It’s NOT the same as a banana…. Really good post, fascinating I had never heard of this. I think many are unaware. I’d never have known if it wasn’t for a lecturer. Thanks for this, so informative and although we never eat brown bits on apples, I will be even more vigilant now, so few know about this too I reckon! Thanks! You’re welcome. I don’t think many people realise the significance of brown bits on apples, so hopefully this helps a little for someone.